The shopping mall atrocity was a response to this — just as the attack on the Twin Towers and the London bombings were explicit reactions to invasion and injustice. Once of little consequence, jihadism now marches in lockstep with the return of unfettered imperialism. Since Nato reduced modern Libya to a Hobbesian state in 2011, the last obstacles to Africa have fallen. “Scrambles for energy, minerals and fertile land are likely to occur with increasingly intensity,” report Ministry of Defence planners. They predict “high numbers of civilian casualties”; therefore “perceptions of moral legitimacy will be important for success”. Sensitive to the PR problem of invading a continent, the arms mammoth, BAE Systems, together with Barclay Capital and BP, warn that “the government should define its international mission as managing risks on behalf of British citizens”. The cynicism is lethal. British governments are repeatedly warned, not least by the parliamentary intelligence and security committee, that foreign adventures beckon retaliation at home. With minimal media interest, the US African Command (Africom) has deployed troops to 35 African countries, establishing a familiar network of authoritarian supplicants eager for bribes and armaments. In war games, a “soldier to soldier” doctrine embeds US officers at every level of command from general to warrant officer. The British did the same in India. It is as if Africa’s proud history of liberation, from Patrice Lumumba to Nelson Mandela, is consigned to oblivion by a new master’s black colonial elite whose “historic mission”, warned Frantz Fanon half a century ago, is the subjugation of their own people in the cause of “a capitalism rampant though camouflaged”. The reference also fits the Son of Africa in the White House. For Obama, there is a more pressing cause — China. 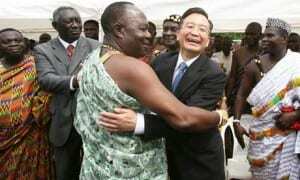 Africa is China’s success story. Where the Americans bring drones, the Chinese build roads, bridges and dams. What the Chinese want is resources, especially fossel fuels. Nato’s bombing of Libya drove out 30,000 Chinese oil industry workers. More than jihadism or Iran, China is now Washington’s obsession in Africa and beyond. This is a “policy” known as the “pivot to Asia”, whose threat of world war may be as great as any in the modern era. This week’s meeting in Tokyo of US secretary of state John Kerry and defence secretary Chuck Hagel with their Japanese counterparts accelerated the prospect of war with the new imperial rival. Sixty per cent of US and naval forces are to be based in Asia by 2020, aimed at China. Japan is re-arming rapidly under the right-wing government of Prime Minister Shinzo Abe, who came to power in December with a pledge to build a “new, strong military” and circumvent the “peace constitution”. A US-Japanese anti-ballistic missile system near Kyoto is directed at China. Using long-range Global Hawk drones, the US has sharply increased its provocations in the East China and South China seas, where Japan and China dispute the ownership of the Senkaku/Diaoyu islands. Advanced vertical take-off aircraft are now deployed in Japan; their purpose is blitzkrieg. On the Pacific island of Guam, from which B-52s attacked Vietnam, the biggest military buildup since the Indochina wars includes 9,000 US Marines. In Australia this week, an arms fair and military jamboree that diverted much of Sydney, is in keeping with a government propaganda campaign to justify an unprecedented US military build-up from Perth to Darwin, aimed at China. The vast US base at Pine Gap near Alice Springs is, as Edward Snowden disclosed, a hub of US spying in the region and beyond; it also critical to Obama’s worldwide assassinations by drone. “We have to inform the British to keep them on side,” an assistant US secretary of state McGeorge Bundy once said, “You in Australia are with us, come what may.” Australian forces have long played a mercenary role for Washington. However, there is a hitch. China is Australia’s biggest trading partner and largely responsible its evasion of the 2008 recession. Without China, there would be no minerals boom: no weekly mining return of up to a billion dollars. The dangers this presents are rarely debated publicly in Australia, where prime minister Tony Abbott’s patron, Rupert Murdoch, controls 70 per cent of the press. Occasionally, anxiety is expressed over the “choice” that the US wants Australia to make. A report by the Australian Strategic Policy Institute warns that any US plan to strike at China would involve “blinding” Chinese surveillance, intelligence and command systems. This would “consequently increase the chances of Chinese nuclear pre-emption … and a series of miscalculations on both sides if Beijing perceives conventional attacks on its homeland as an attempt to disarm its nuclear capability”. John Pilger’s new film, Utopia, is released in cinemas in the UK on 15 November and is launched in Australia in January. He can be reached through his website: www.johnpilger.com. Posted in CIA + GOVT CRIMES, COVERT OPS & INTELLIGENCE, CULTURAL POLITICAL ISSUES, IMPERIALISM.